The Purple Swamp Hen, by Penelope Lively: I enjoyed this collection of short stories from one of the grande dames of English writers; I feel remiss that I haven’t sought out Penelope Lively’s work before. The Purple Swamp Hen includes fifteen stories, many of which are about the challenges (and indeed, failures) of marriage and domestic life. Sly wit and a keen eye are hallmarks of the collection, which I found, with only one exception, quite engrossing. Highlights (for me, anyway) include “Mrs. Bennet,” which imagines what that nervous character would be like in the mid-twentieth century; “License to Kill,” about an aging spy and her young companion, off to the grocery store; and “A Biography,” which tells the story of a woman’s life through interviews—always incomplete—with her friends and family. 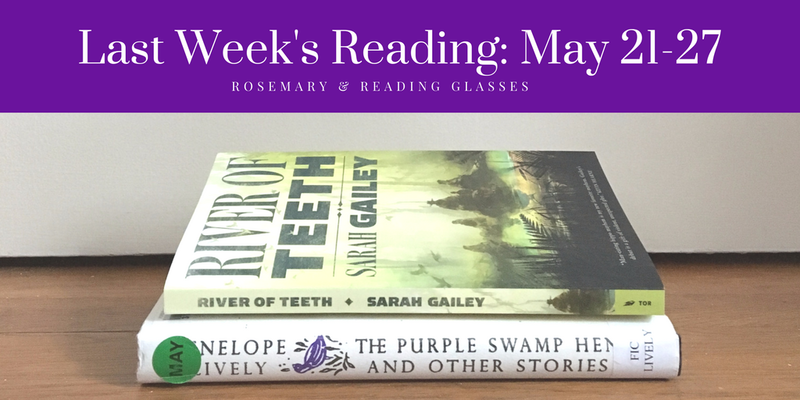 River of Teeth, by Sarah Gailey: Sarah Gailey is one of my favorite Twitter personalities, and I’ve been looking forward to her debut novella for months. River of Teeth is rollicking good fun, a marvelously spun tale of mercenary hippo wranglers pitted against a ruthless riverboat casino magnate and his feral hippopotami. Really. It’s a fierce, funny, alternative history adventure (featuring a delightfully diverse cast of characters) that will have you wondering how you’ve gone so long without man-eating hippos in your life. The only Penelope Lively I’ve read is Consequences, which I loved when I read it years ago. I’d love to read the “Mrs. Bennet” story! I like every thing you mentioned here: P&P, Twitter personalities, novellas, hippopotomi… what a great week! And I’ve never heard of either author. I adore Sarah Gailey’s Twitter presence too – so pleased River of Teeth is good! Oh goody, glad to hear that River of Teeth was fun. I like that author’s twitter presence too, and I do not exactly like hippos but I like the history of hippos, so it’s excellent to hear that the novella is a good one. Penelope Lively is on my list of MRE MustReadEverything authors, but I have so many left to read (including this one). Each of the stories you felt was a favourite sounds just perfect to me!